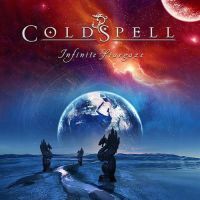 The comparison that immediately springs to mind is the 90s act Millenium (featuring Jorn Lande and Ronni Le Tekro), but Coldspell most definitely can’t be pinned down as a clone of any other band. There are tracks such as ‘Raving Mad’ and ‘Straighten Things Out’ that bring the 80s and bands like Danger Danger andf TNT to mind, whereas the super heavy ‘Eye of the Storm’ could have come straight off the latest Jorn solo album, and one can almost hear the man himself singing (or at least humming) along to the superbly powerful vocal performance by Niclas Swedentorp. And so the story goes throughout this massively impressive album: ducking and weaving between heavy riffing and soaring choruses, light-hearted rockers like ‘Surrounded’ and ‘Solid Ground’ that lead you straight to head-on collisions with darker and more muscular tracks like ‘Fade Away’ and ‘Night Falls’. It all concludes with the majestic and Dio-esque (or should I say ‘Rainbow-esque?) ‘Infinite Stargaze’ that somehow seems to sum up a lot of the influences you hear scattered about the album. This is Jorn, Dio, Rainbow, Dream Evil, Whitesnake a little 80s, a sprinkling of AOR and a whole lot more all rolled up into one big punch in the face. In a word: Great! There are no fillers on this album (although a few choruses do get just a tiny bit too ‘melodic’ to my taste), the production is superb, and the singing of Mr Swedentorp is the icing on the cake that catapults these tracks from very good to pretty effing awesome! This is a band that I’m really going to look forward to hearing more from. Gaze towards the stars, and you will see Coldspell way up there where they belong. Go buy … now!